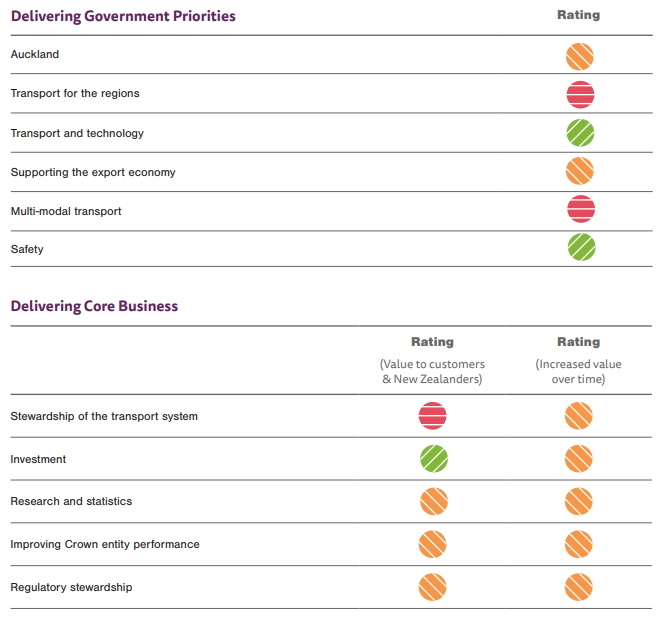 Last year the Ministry of Transport was subjected to a performance review, the results of which are now out and they don’t make for good reading. 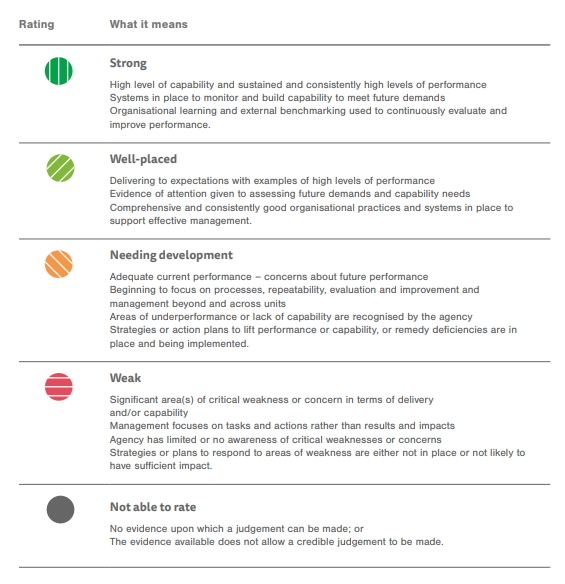 Out of the 28 attributes and tasks they were rated on, only in five were they considered ‘well placed’, only the second highest rating. The rest were listed as needing development (17) or weak (6) while in no areas were they considered strong. If I had a performance review like that in my day job I’d probably be needing to look for a new one. The reviewers say as much, commenting that the organisation needs a “re-boot”. Even some of the areas they were marked well in feels a bit generous. For example, they were marked well for safety despite the road toll increasing again and the ministry seeming to offer no insight as to why and undertaking no actions to reverse this new trend. One area the Ministry are marked well on is technology. This is not a surprise given it often feels likely they’re dedicating most of their resources into thinking about things like driverless cars and pizza delivery drones while little is spent on the short and medium term needs for the country. Below are the rankings for each of the 28 areas mentioned along with the rating system. Here are some of the more interesting comments from the report. It’s not an exhaustive list as there are just so many that could be included. They get credit for “progressing the City Rail Link” because of the Heads of Agreement work they conducted. But this doesn’t take into account the years they spent trying to undermine and stop the project. The Ministry as a whole will need to continue to devote resource to increasing its knowledge of Auckland transport issues and develop the capability and capacity to contribute effectively at the level and pace compelled by the city’s growth. It does not have an option to take its own time or it will quickly lose relevance. There are mixed views within the Ministry about what it can contribute, and what role, if any, transport policy has to play in supporting regional development. As a result the Ministry has adapted a passive ‘hands-off’ approach to the issue and is not really doing anything. Further work is required to understand the underlying causes and potential initiatives to address this trend. This is likely to require a re-evaluation of the approach to road safety. The third Safer Journeys Action Plan was seen by many as a missed opportunity, although there is growing confidence that the next Road Safety Strategy will provide impetus for a different approach. The Ministry needs to be Bold, Invested and show leadership in road safety by exposing to public debate the wide social impacts and tradeoffs that new technologies offer in this space. The Ministry has traditionally had a strong focus on the economic analysis of transport, focused largely in the silos of the different transport modes, with social, environmental and cultural aspects less well-understood. Excellent work has been done in the 40-year horizon, but there is no intermediate 5-year strategy to guide the work on more immediate priorities and development of the Ministry’s leadership in the transport system. The Ministry has developed these strategic statements largely internally and has not engaged the wider transport system. This means that partners and stakeholders do not understand the Ministry’s rationale. They do not see a compelling proposition from the Ministry that they can link to and that would drive a better understanding of the total system. Some of the disconnections across the system have been reinforced by a largely siloed, modal approach to transport policy within the Ministry as well as the legislated focus of the individual transport sector agencies. Organisational changes, underway at the Ministry at the time of this review, will change this structure and way of working. This is necessary, but is not the solution on its own. Further to this, there is evidence that many decisions, which could be made at lower levels of the organisation under a proper delegations framework, are being handed off up the chain. This has concentrated decisionmaking, even for quite routine issues, at the top of the organisation. The consequence is that many people within the Ministry are not held accountable for their work. Being able to write a paper well is seen as more important than having good quality advice. The Ministry has identified that it does not have a strong ‘culture of learning’, despite in the past having worked to improve the quality of its briefings and policy advice. I think these comments reflect very poorly on the former CEO. Especially seeing as a similar review in 2013 also revealed serious issues. In mid-2016 a new CEO was appointed and they’ve just been through a large restructure which has seen significant change at the senior management level. He was also the one who instigated this review. In an article about the review, Phil Twyford made a number of positive comments about the future he sees the ministry should be focusing on. Let’s hope they get the message quickly. He said the ministry was excited by these challenges and he was confident they could deliver the policy he needed. Twyford floated his interest in increasing central government public transport subsidies to councils so they could reduce the prices of buses and trains on the weekend – possibly even making them free. Unlike his predecessor Simon Bridges, he is less keen on another version of the transport future – one that sees autonomous private vehicles take the load off other transport systems. “I’m not of the school of thought that thinks that technological change like autonomous cars and pizza-delivery drones are going to rescue the transport system so that we don’t have to build rapid transit systems,” Twyford said. He did see “mobility-as-a-service” systems where people organised many forms of transport from their smartphone as “the future” however. The government’s job was to provide the best “mix” for each person. I guess one good thing about this review is there’s only really one direction to go from here, up. Most of this report is poetry to my ears. The Ministry certainly needs to be bold, invested and show leadership in road safety by exposing to public … experience the impact that shifting from car-dependent planning, and making physical, enforcement and strategic changes … offer in this space. It’s great to have such transparent accountability, however given the political directives that MoT (& NZTA) work under, this report is fundamentally an assessment of the previous Government’s approach to transport. I totally agree, in my limited experience working with MoT they were the definition of sycophants. Rather than provide meaningful independent advice on how we can meet our transport challenges, they instead devoted their time to making excuses for maintaining the status quo. Which of course was the hallmark of our last government. I think the high mark for technology is simply the state Services Commission telling them ” for God’s sake don’t go updating your computer system with some expensive bespoke software the way other ministries do”. I hope they do change from the hands-off approach on regional transport planning. Small producers in regions could be far better served, whether selling to the national or international market. I suspect “supporting the export economy” is a regressive rating as it will focus on the big producers only, who have different transport needs from the small ones. If we want our economy to be sustainable, and want some resiliency, we’re going to have to shift to considering smaller producers. Those ratings are a joke. How on earth do they get “well-placed” on investment, asset management and financial management, if that investment and management isn’t delivering what is required? This makes my day: “I’m not of the school of thought that thinks that technological change like autonomous cars and pizza-delivery drones are going to rescue the transport system so that we don’t have to build rapid transit systems,” Twyford said. but but Tesla but drone but Electricity! Dear god. This is a pretty strong indictment of some longstanding ways of doing things. The transport sector does need better strategic and technical leadership. There is strong capability in a lot of organisations, but it’s often difficult to get it pointed in the right direction. I worry that there’s a bit of a culture of ‘rework/re-investigate’ when in reality what we need is consistent delivery. The Ministry should be the one providing that leadership, but it’s historically been a bit of a void. Here’s hoping this is an invitation to improve. g) modify the economic manual to allow for a wider range of modes to be funded. h) Work on a parking pricing strategy that allows parking costs to be holistically used to manage peak commuter travel demand where congestion tolling is not introduced and there are network capacity limitations. b) Government to fund “true public transport”. i.e. max 30 min headways on a 24hr full coverage network (on-demand transit to/from hubs where fixed routes are not cost effective – means most night services would be on-demand with a small core). Local government to fund service levels above this (i.e reduce headways on key full coverage network routes and introduce rapid transit hub to hub services). c) Introduce a NZ wide standard for multimodal transport concept design (different designs for different on demand levels). Developer and local government designs have to be multimodal and start with walk as the base and work up to motorized transport. a) Remove the land zoning system and go effects based. The land use system has to be able to respond to transport. This poor leadership in transport is evident everywhere. Auckland Council, AT and Panuku cannot hide from the fact that they are currently all involved in decisions to build not one. but two multi rise parking buildings in Takapuna, when there is no demonstrated need that any are required. If anything is to change the current disposition of almost every agency that is charged with providing transport solutions, I think that it will come from the directions of senior politicians who see the wider climate change issues. The only thing they should be building in Takapuna is a light rail station, and they should be building those in every urban centre that is still without a station, which is most of them. Every day of delay is another day spent spewing CO2 into the atmosphere. To me it’s grossly irresponsible to be continuing with carbon-based transport planning when we live in a country with such abundant renewable energy. Nobody in AT or our Council seems to have a long-term vision or an awareness of how urgent and how critical the need is to act on change change. I’m desperately hoping to see change with the Green coalition now installed in Wellington, because they are our only hope now. You guys spend your whole life in an echo chamber. Look at the Public Transport Plan for Takapuna, no rapid rail or light rail till 2030…2040..? In the meantime the bus network will only cater for a portion of trips given the poor frequencies. So are you saying you dont want Takapuna to grow or you want the urban form destroyed with developers having to provide parking site by site? Takapuna should only grow if that growth doesn’t require multi-story car parks. Perhaps if the bus frequency and speed is too poor we could improve bus speed and frequency but installing bus lanes and running more frequent services? Yes good luck, GT. I wonder if it would be worth your while asking whether a non-motorised user audit has been completed as part of the safety audits, ie at concept, scheme, and detailed design, and how the project’s impact on walkability and pedestrian amenity in local communities has been assessed. Hey! At least we can’t blame corruption! We are just a nation of incompetents! Yay!